At least one Superfund site was damaged and leaked toxic chemicals in Texas, despite early information that the sites were secure, the Environmental Protection Agency confirmed September 28. New tes t results found very high levels of chemicals called dioxins around the San Jacinto River Waste Pits Superfund site in Channelview. The EPA previously said that the site needed further investigation, which was ongoing, but an armored “cap” intended to contain the waste should have prevented any toxic material from leaking. Part of this site is always underwater but after Hurricane Harvey flooding was up to 12 to 14 feet. Dioxins can cause cancer and reproductive problems, as well as damage the immune system, according to the EPA. 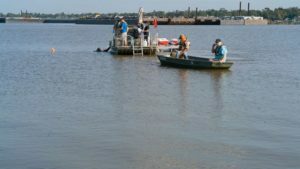 Low levels of dioxin have detected in the river before and humans can be exposed to it by swimming or eating seafood from the water, according to the Galveston Bay Foundation. Thursday’s testing results released by EPA found levels at 70,000 nanograms per kilogram, more than 2,000 times the recommended level of 30 ng/kg, according to an EPA press release. The toxic chemical that leaked does not dissolve in water and could continue to spread. The company responsible for the site will continue to conduct testing in the area. The San Jacinto River Waste Pits Superfund site was contaminated with waste from paper manufacturing and was added to the Superfund list in 2008. The site was stabilized in 2011, according to the regional administrator, but it is still listed as one of the most contaminated sites in the country. The companies considered potentially responsible for the pollution are also responsible for maintaining the site. On Sept. 9, EPA said they were using heavy equipment to cover the cap with rock and removed nine truckloads containing 45,000 gallons of stormwater from the area. “The armored cap performed exceptionally well during the Hurricane Harvey storm event and remains fully intact,” communications director Tom Ryan said in a statement. ABC News’ Kenneth Moton visited the San Jacinto site with EPA and local officials on Sept. 4 after some of the flooding receded. At that time the acting regional administrator for that area, Sam Coleman, said teams were working to inspect and repair the cap but they were pretty confident there were no leaks and that the San Jacinto site was secure before the storm hit. After Hurricane Harvey, EPA reviewed aerial photos of the 41 Superfund sites in the Houston area and determined that 13 sites needed further testing. On Sept. 3 The Associated Press reported that the EPA was not on scene at the San Jacinto site, though EPA questioned the accuracy of that report. As of Sept. 9, some of the flooding had gone down and EPA and other officials were able to visit the sites and begin working at the sites.